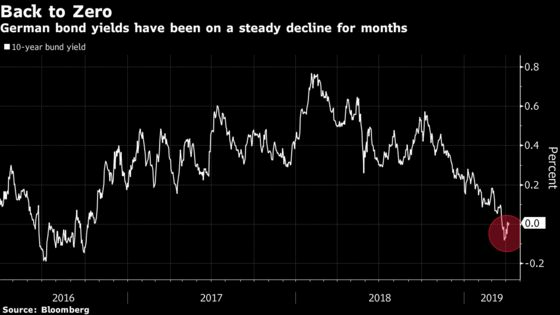 The region’s bout of misery this year -- Germany’s industrial slump and the struggle to fix its banks, Italy’s inability to reform, the apparent defeat of central bankers seeking to wean the euro area off stimulus -- may seem to make perpetual malaise look inevitable. The euro region’s economy is similar in important ways to its Asian counterpart two decades ago: Interest rates at or below zero, the mountains of debt and non-performing loans, populations transitioning from an aging society to an aged one. Economists insist there are limits to the comparison, though, while acknowledging that a prolonged period of European stasis, deflation and central bank impotence remains a threat. Japan’s so-called lost decade, triggered by the bursting of a bubble in stocks and real estate, pushed the economy into anemic growth or none at all, with rising unemployment and falling interest rates. Here are some of the ways Europe is heading in that direction -- and some of the ways it isn’t. Aging populations are often thought to weaken inflation pressures, as people save for retirement and spend less per capita. 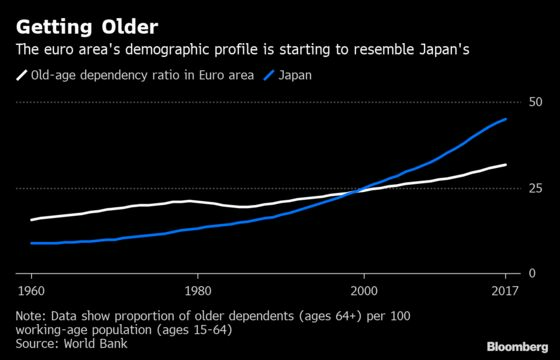 Japan’s demographic squeeze has brought more women and old people into work and pushed the overall unemployment rate to 2.3 percent, near the lowest level in more than two decades. Yet wage growth is tepid, insufficient to spur inflation. The Bank of Japan has battled deflation for much of the last two decades. 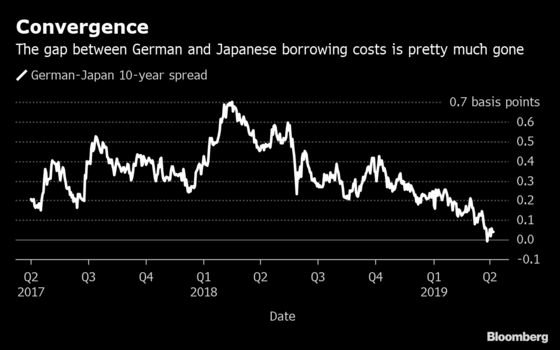 The ECB got a taste of that struggle in 2009 amid a recession and in the aftermath of the euro area’s sovereign debt crisis. While Japan’s woes began abruptly at the start of the 1990s, the euro area slid more gently into weak inflation and growth. The BOJ was the first major central bank to embrace radical monetary policy, yet it’s still locked into negative interest rates and asset purchases, and weighing more easing. The ECB is a long way from raising rates. While it may be unable to adopt more BOJ-like measures if the slowdown worsens, the bank could be locked into its current stance for a while. 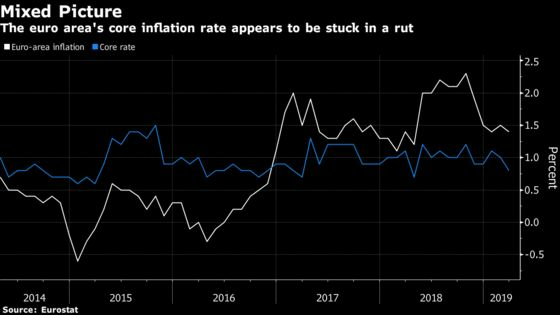 While inflation in the euro area has picked up, it’s still below the ECB’s goal of just under 2 percent, and the core rate is stuck around 1 percent. 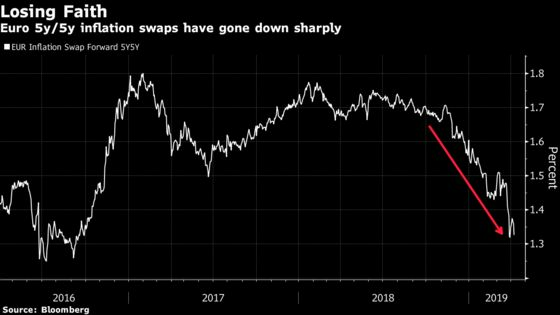 The ECB says the risk that markets anticipate even slower inflation is “very low.” Investors are less sanguine: A gauge based on derivatives prices has plunged to 1.3 percent, the lowest level since 2016 -- when the ECB was buying bonds at a rate of 80 billion euros ($90 billion) a month. Japan’s debt-to-GDP ratio is now above 230 percent, and rising as deficits pile up. European Union rules impose fiscal limits that will limit such a buildup. The euro area’s ratio is 89 percent and is forecast to decline slowly, though a weaker economy and the need for fiscal stimulus could hamper progress. The euro area’s more dynamic labor market, with both external and internal migration, is a key caveat to comparisons with Japan. Net inflows of migrants peaked in 2015 as a recovering European economy coincided with instability in North Africa and the Middle East. That helped soften declines in the working-age population. 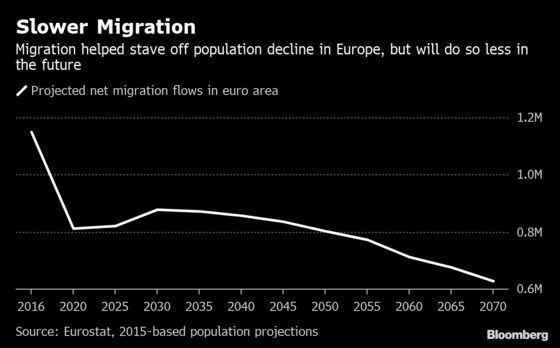 More recently, however, Europeans have grown resistant to large-scale immigration. Annual net inflows into the euro area will decrease in the coming decades, according to Eurostat. Japan, with 126 million people, has only about 1.3 million foreign workers and remains opposed to a formal immigration policy. The government is likely to issue five-year residency permits to as many as 345,000 low-skilled workers over the next five years. That would plug about one-quarter of the predicted labor shortfall.